Southeastern Free Will Baptist College, he has been in the ministry of sharing God’s love. He served in South Carolina as Youth Pastor, and in Missouri as Associate Pastor and Pastor. He loves the Lord and desires to show the love of Christ to everyone he meets. His wife, Joy, is from Missouri. She also graduated from Southeastern Free Will Baptist College with a Music and Missions degree. She has been involved in music ministry for many years. She enjoys teaching young people music and how to use it for worship in their lives. 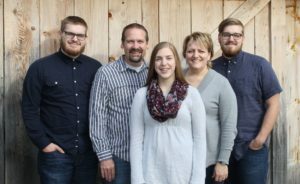 After 13 1/2 yrs of ministry service in the state of Missouri, Darin and Joy felt God leading their family to the state of NY. They served in Buffalo for two years before moving to Erie where they have served Flagship Church and the community. Dalton, Dylan and Melissa have been the greatest blessings to the marriage of Darin and Joy. Their children are a blessing to the ministry as well as to everyone who meets them.